Arthur has been directly involved in a wide variety of software development projects. He is also a teacher and is the author of twelve books on programming. With his background in radio and television he is able to keep his presentation a bit of an entertaining romp. His talks and seminars are filled with facts and interesting stories from his experiences. He has performed as the voice behind a puppet on a daily children's TV show, a TV weather man, host of a late night TV horror movie, and was a news anchor. A member of the Screen Actors Guild for five years, he appeared in several national radio and television commercials. He has performed roles in national TV series and in motion pictures. He has acted in more that 25 full-length plays and directed three. He spent some years of his youth as a radio disk jockey. 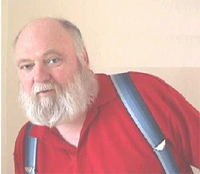 He was an independent computer contractor and consultant from 1977 through 1998. His computing experience includes a health insurance data systems, monitoring oil-well drilling operations, long distance telephone line quality, satellite communications, search engine, point of sale system, multi-computer work flow system, missile guidance control and other classified work for the Department of Defense. He spent some years as a specialist writing computer language compilers and, as a result, has worked in and on 23 programming languages and on as many different computer platforms. He is very familiar with all phases of software development projects.